IAF Commander Eshel and other senior officers fly Douglas A-4s for last time as the jet is retired. Senior commanders of the Israel Air Force, led by Maj. Gen. Amir Eshel, the IAF Commander, conducted a ceremonial aerial demonstration Sunday morning to mark the retirement of the Douglas A-4 Skyhawk from service in the IAF, after 48 years. Eshel and the other commanders flew the Skyhawks – known as 'Ayit in Hebrew – over every single IAF base in Israel. "Servicemen of all ranks from the Technical Division and the Materiel Directorate Headquarters, are at the end of an era which provides an example of professionalism, determination and devotion, a source of might for the entire Air Force," said Eshel in the ceremony. The Skyhawk era in Israel began on December 29, 1967 when the first four Skyhawks were unloaded from a ship which arrived at the Haifa Port. They were absorbed into the "Valley" and "Flying Tiger" Squadrons, which established especially for the new aircraft. 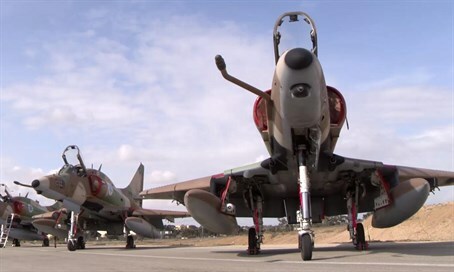 The jets took part in every Israeli campaign ever since, and served as the IAF's primary strike jet during the War of Attrition that followed the Six Day War. "Along the way we lost many good people on the ground and in the air," said the IAF Commander, "We will never forget them. We will continue walking in their light, hand in hand with their families." The IAF Website wrote that during the Yom Kippur War, the Skyhawk Squadron aircrews conducted about 1,000 operational sorties in the southern front. About half of the aircraft were hit during combat, and seven aircrew members were killed. In the early 90s, the Skyhawks' Flying Tiger Squadron was appended to the IAF's Flight School.